SAN PEDRO, California, December 4, 2011 (ENS) – The Port of Los Angeles is leading ports around the world in the development of a carbon calculator to estimate greenhouse gas emissions from port operations and explore reduction strategies. Ports can use the free carbon calculator to compute the amount of carbon dioxide emissions from sources associated with their operations, such as cargo handling equipment and harbor craft. Equipped with that information, ports can plan on how best to reduce their carbon footprints through the calculator’s Reduced Emissions Scenarios feature. “The carbon calculator is a powerful tool to help each port chart its own course toward reducing greenhouse gases,” said Port of Los Angeles Executive Director Geraldine Knatz, PhD, who also serves as president of the International Association of Ports and Harbors, IAPH. “A consistent methodology among ports will help us assess our global impact,” said Dr. Knatz. The carbon calculator is a software package that allows ports to estimate existing carbon dioxide emissions from direct, port-owned sources such as fleet vehicles, cranes, harbor craft and cargo handling equipment, and also indirect sources such as electricity purchased for port-owned buildings and operations. It also serves as a planning tool that ports can use to compute the benefits of replacing or retrofitting equipment with systems or machines that run on renewable energy. The carbon calculator is a project of the World Ports Climate Initiative, an IAPH collaboration launched in 2008. 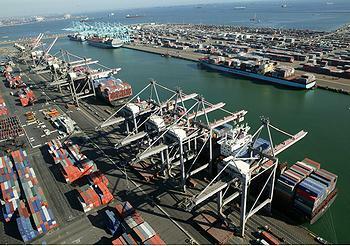 The Port of Los Angeles, one of 59 WPCI members, has taken the lead in developing the calculator. More than a dozen port authorities and organizations have been collaborating on this project through the WPCI’s Carbon Footprinting Subgroup. The initiative is aimed at identifying and promoting effective, sustainable practices and strategies for ports and harbors to improve air quality while remaining vital economic engines. Future projects under consideration include a similar calculator for terminal operations and a goods movement calculator to estimate greenhouse gas emissions from moving cargo from its point of origin to the point of delivery. Like other World Ports Climate Initiative projects, the carbon calculator indicates the commitment to share best environmental practices among members of the International Association of Ports and Harbors, says Fer Van De Laar, director of WPCI and managing director of IAPH.